Internet Explorer 8 web browser has loads of features for cool web browsing experience. It has been available for free download for a while now. Incase for some reason like slow internet connection, you cannot download Internet Explorer 8 web browser – you can order free CD of Internet Explorer 8 from Microsoft! Click here to access free Internet Explorer 8 CD media order webpage. Select your country location from the drop down menu and then enter your shipping address details. While CD is free of cost, you will have to pay for shipping charges which vary according to country or location selected. 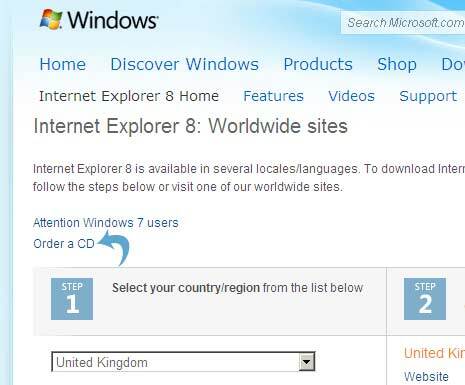 Order a Free IE8 CD or download IE8 from Microsoft website – take your pick! I have a computer that I canceled google on, since then I don’t have access to the explorer, system indicates that there isn’t any internet explorer. I can’t download from that computer. Please help. Please i need one seriously ok . Please send me one. my name is ravi chandran. i am stay from chennai(india). I want free cd in internet explorer. @Oner Fusion : u r rite buddy ! why we pay 500 to Microsoft ??? Bill Gates is very clever he never give u anything free !! Go and buy CHIP , DIGIT Or any magazine or download it now and njoy ! Please send me a Cd of Windows Explorer 8. For some reason the copy keeps rejecting my installation off the internet. I have tried to speak with someone about this and was told that I need just the Windows Explorer 8 alone. This will correct the problems and errors I’m experiencing when I start up my computer. I would greatly appreciate it if you can do this for me.